THE NUMBER of internet users from the United States trying to plan trips using AA Ireland’s online Route Planner rose sharply last month – leading the AA to suggest that The Gathering tourism initiative is set to bring significant numbers from North America. 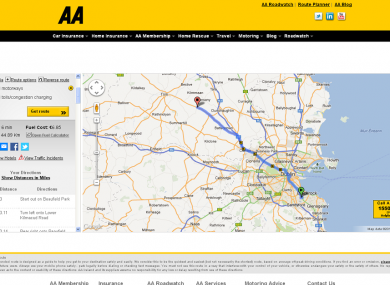 AA Ireland says over 20,000 users from the US downloaded directions for a road journey from the Route Planner in January – an increase of 68 per cent on the number of US users from January 2012. “Of course we don’t know how many people will actually come and visit us but for route enquiries from America to be up by 68 per cent is encouraging,” AA Ireland’s Conor Faughnan commented. “In the context of the Gathering this is a very good indicator,” he said. Route inquiries from users in France, Germany and the Netherlands also increased in January 2013, but disappointingly, UK queries were down by 1.4 per cent. Email “Major increase in number of American users of AA route planner”. Feedback on “Major increase in number of American users of AA route planner”.